Destination Eden is clearly one of the true spiritual-ethical books everyone needs to read in order to awaken and understand what our true biological diet and lifestyle needs are. If we are to survive as a species and co-exist with other beings, we need to understand that "Eden Fruitarian", as Mango Wodzak coined, is what we need to embrace in our lives if we want to create a world of peace and love. No longer can we argue against the fact, that eating food from the Garden of Eden is what our bodies' are biologically designed for. A highly recommended book for everyone." This book is a great tool in the admirable goal to shed much of the industrialization of our lifestyle and our food. Written in an engaging and very personalized manner, by the time you finish the book, you will come to enjoy this author as a friend. While fruitarianism isn't my thing, I've been wanting to read more about it since so many fellow vegans explore this lifestyle. I found this guide to be well written and informative. It's definitely going to be useful if I need to recommend reading materials to someone or if I choose to do a fruit fast in the future! In the latter half of the 1980s, it suddenly dawned on me how many innocent animals had been sacrificed purely because I had, all my life, accepted without question that they were there for us to do with as we wished. This thought hit me like a day wearing new shoes, and I immediately made the decision to cease devouring slaughtered animals. I guess, with the realisation that I myself could not take the knife to the throat of a cow, or any other animal, without feeling a tremendous amount of remorse, it therefore seemed hypocritical of me to turn a blind eye to the fact that others were doing this brutal, bloody work for me. Thus began my journey toward returning to my true self. Over the many years which have passed since then, I feel I have been blessed with a series of equally profound revelations, each one guiding me forward on my journey. I feel it is now my duty to share my revelations with the world, with the hope that those who are ready for them may also learn, progress and prosper from them. This is the sole purpose of my writing. Currently, I find myself living with my life partner, and fellow long-term fruitarian, Kveta, in the tropics of North Queensland, Australia. 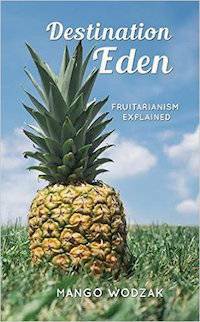 She too is in the process of writing her own books, which when finished I will be sure to include on my website Eden Fruitarianism. We do not know how long this process will take, she is writing in her mother tongue, the Czech language, so it may take even longer before an English-language version is available. You can read online interviews here and here. Or alternatively you can watch and listen from the following media files: here, here and here.